’Tis the season to be afraid — very afraid. Corpus Christi transforms from “Sparkling” to the “Spooky” each October as frightening events pop up all across the “City by the Sea.” The events listed below are not for the faint of heart. Use caution even when reading about them — the descriptions are enough to raise goosebumps. This 100-year-old, 13-room haunted hotel has been featured on the Travel Channel and National Geographic. This year, two new terrifying haunts have been added: Evil Visions 3D and 6 Fl66rs of Hell. 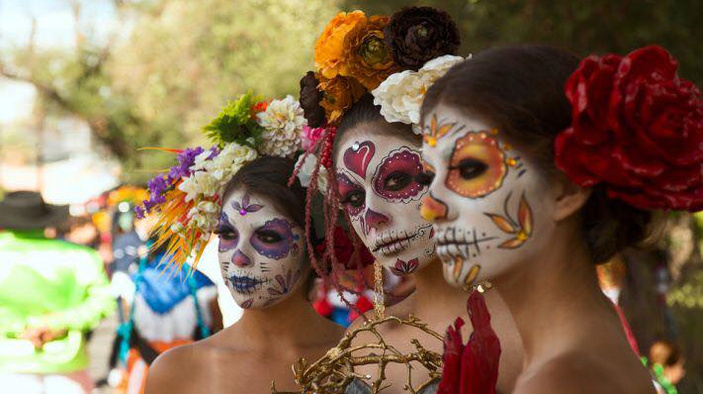 Fright Night Haunted House will also hold a Dia de los Muertos celebration on Oct. 27 with music, food, and beer. Fright Night Haunted House is open nightly from 7 p.m. to midnight through Oct. 31. The haunted house is located at 615 Mesquite St. Visit imnotgoinginthere.com. The Haunting on the Blue Ghost is open weekends Oct. 12 through Nov. 3. Pick a date and join the event from 7-10:30 p.m. on the USS Lexington, 2914 N. Shoreline Blvd. Visit usslexington.com/haunted-house. Step into Boogeyman’s closet, the main attraction at this bone-chilling haunted house — which is a truly haunted building. Located off “the road to Hell,” the closest neighbors are a cemetery full of unmarked graves and a battlefield from the Texas Revolution. General admission is $20. Or, pay $10 extra for a VIP ticket to skip. One level of the haunted house is wheelchair-accessible. The Hauntings of Boogeyman is located at 4813 Main St in Mathis. For more information, visit boogeymanshauntedhouse.com or call (361) 288-5006. On Saturday, Oct. 27, from 3 p.m. to midnight, 10 blocks in downtown Corpus Christi burst into a colorful celebration for Dia de los Muertos. Three stages feature live entertainment, including Ballet Folklorico and mariachi music along with local bands playing tunes with a Texas twist. A kids’ area will have crafts, games, and a climbing wall. Student art demonstrations, a piñata contest, a gallery exhibit, a giant puppet parade, vendors, and food will delight everyone on the streets. Inside the Ritz Theater, altars commemorating lost loved ones lend a more spiritual air to this celebration of the dead. The 11th Hour Escape locks you in a room with strangers as decipher a series of clues, puzzles, and riddles to find your way out. Choose between three escape options: Pirate Captives, The Jungle, or Cottage Chaos. Each escape is terrifying in its own way with just 60 minutes to solve the puzzles. Visitors can choose from three levels of difficulty, depending on experience and skill. But beware: Even experts only have a 10 percent chance of escape! The 11th Hour Escape is located at 4455 South Padre Island Drive, #105, in Corpus Christi. Visit 11thhourescape.com or call (361) 429-2424 for more information. In what has become a Corpus Christi Halloween tradition, the Aurora Arts Theatre tells the tale of mad scientist Frank N. Furter’s strange castle and insane laboratory. “The Rocky Horror Show” opens Sept. 14 with performances on Fridays and Saturdays through Oct. 31. Special showing at 7 p.m. Wednesday, Oct. 31. The Aurora Arts Theatre is located at 5635 Everhart Road in Corpus Christi. For tickets and more information, visit auroraartstheatre.com or call (361) 851-9700. Harbor Playhouse presents a musical comedy spin-off of “The Addams Family” TV show with an original story about the darling and devious Wednesday Addams all grown up and in love with a man her family has never met. See what unfolds at the Harbor Playhouse on Sept. 21 with performances on weekends through Oct. 31. Added performances are at 7:30 p.m. Monday, Oct. 29; Tuesday, Oct. 30; and Wednesday, Oct. 31. Harbor Playhouse Community Theater is located at 1802 N. Chaparral, Building 2, in Corpus Christi. For tickets and more information, call (361) 888-7469 (SHOW) or visit harborplayhouse.com. Focused on ages 12 and younger, the Corpus Christi Museum of Science and History is hosting its annual Boo Bash. The event will feature trick-or-treating, a costume contest, a cake walk, a science show, carnival games, and more. Fantasy stations with themes such as Wizards World, Pirates, Superheroes, and Enchanted Kingdom will offer fun activities from 10 a.m.-8 p.m. Saturday, Oct. 27. The Museum of Science and History is located at 1900 Chaparral St. Call (361) 826-4667 or visit ccmuseum.com for more. On Halloween night, head to Heritage Park for trick-or-treating. The historic homes will be turned into Scaritage Park with live music, food trucks, games, and, of course, candy from 5-8 p.m. Wednesday, Oct. 31. Dogs take the costumed stage at the Thomas J. Henry Bark in the Park Pet Costume Contest and Expo from 2-7 p.m. Saturday, Oct. 20, in Cole Park. The family-friendly event benefits several Corpus Christi pet shelters. The Cole Park amphitheater is located at 1526 Ocean Drive in Corpus Christi.